Whew! 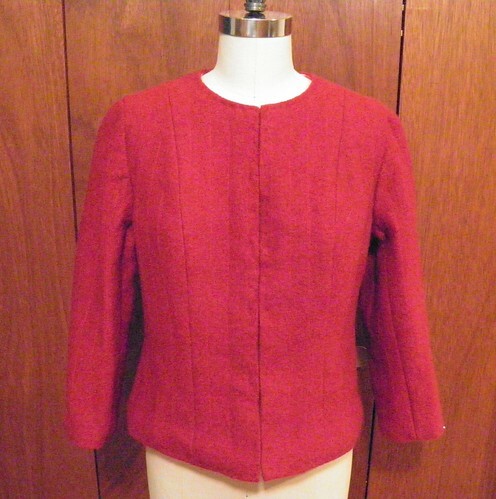 Sleeves are now trimmed and buttons added. My right hand is definitely hurting from all the hand-sewing I’ve been doing this past few days, and I hope I can stand to wear the jacket! When you have, umm, been so intimate with a project for such a long time, it kinda loses its appeal, you know? My friend shared a video with some friendly little helpers to get me thru the last bits. Enjoy! 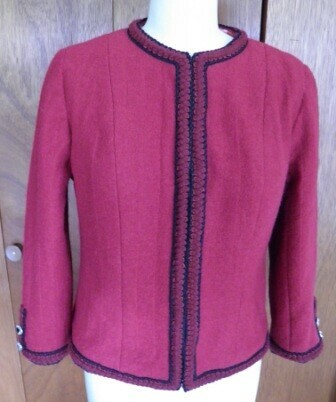 This was pretty much how I spent the day today – applying trim to my red Chanel jacket. No wonder the custom fit, hand-sewn jackets start at over $20K. I really enjoy stitching by hand, but I am discovering there are definite limits to my enjoyment! I would prefer not to keep count of all the hours invested in this garment, but I can honestly say LOTS. As of tonight, I have applied all the black (2 rows!) 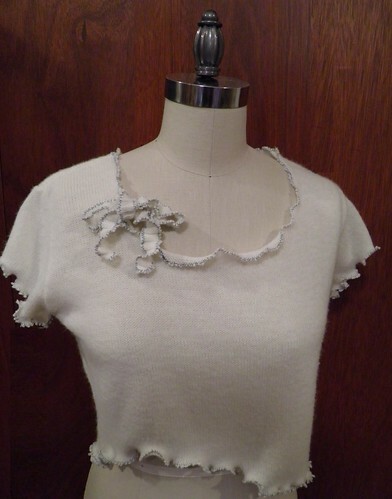 and red trim to the front, neck, and hem edges, and stitched the signature Chanel chain into place along the hem edge. 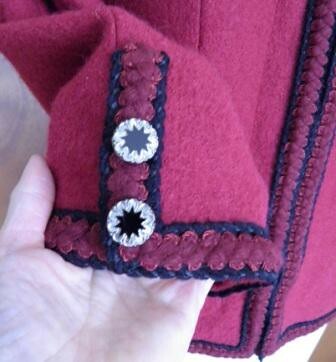 If I am not too grumpy tomorrow I hope to tackle applying the trim and buttons to the sleeves. 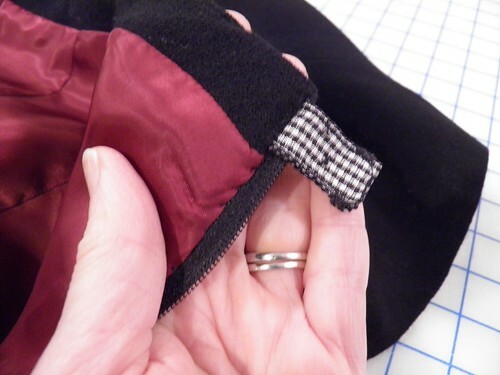 That will leave only the pockets to design, sew, trim, and apply to the jacket. I am also thinking about adding some beads to the trim, but for sure that will wait for a later day. Enough already! 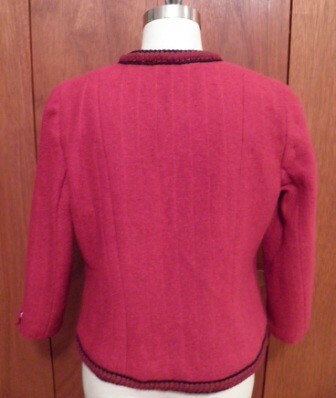 Back view,with some wonky sleeve hanging-ness. As many times as this jacket has been folded up and carted somewhere it is amazing it looks as good as it does! 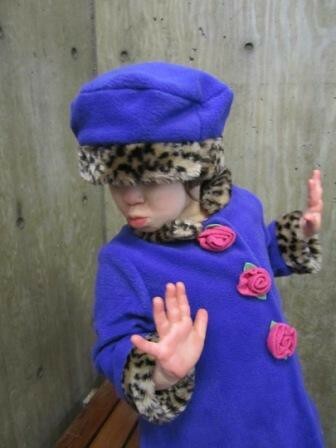 You asked for it – and here she is – the cutest six year-old in the world in her stylin’ new outfit. I had so much fun making this coat and hat for her, and she was soooo appreciative that I wanted to immediately go cut out something else for her. If she didn’t already have a closetful of clothes I would sew constantly for her. Thanks to her beautiful and wonderful mom for taking and sharing these darling pictures! I think she was having a fun day at the park, and for sure she was the most stylish girl there. 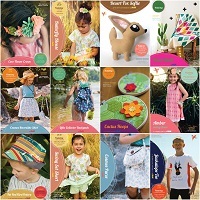 Now go sew something adorable for a cute little girl or boy in your life – happy sewing! 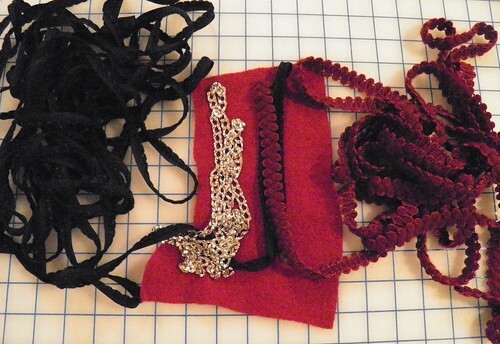 Ten yards of black trim, five yards of red trim, some silver chain, and 2 (or 4?) pockets and a pile of buttons are the only things that stand between me and a completed Chanel jacket. 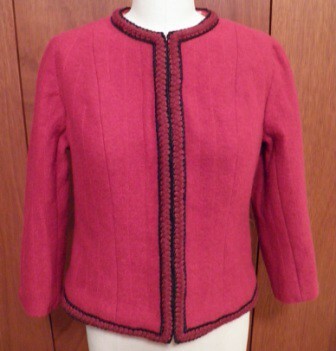 Yes, the jacket I started last spring in a Susan Khalje workshop. The one I was so confident I would finish in one week. The one I made from fabric I purchased in Paris at least five years ago, without a specific project plan. Some garments just resist getting finished, don’t they? 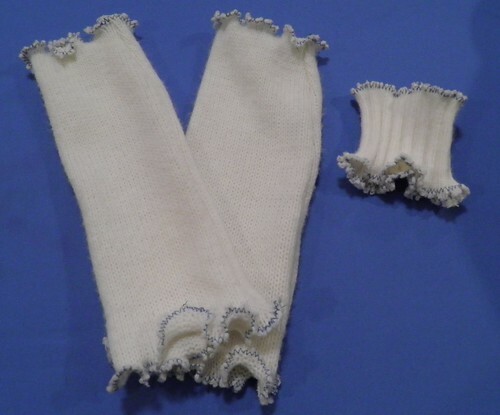 Just like some children take longer to mature, some garments take longer to become wearable. 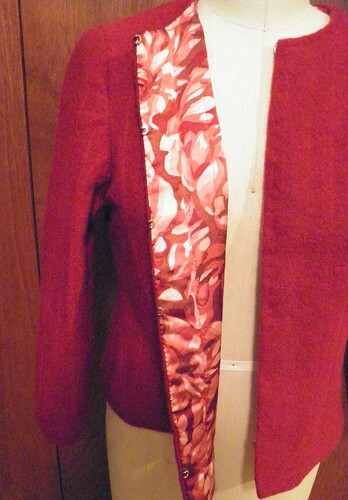 My new goal is to finish this jacket by March 5th. I’d love to wear it to the Sew Expo Banquet next Saturday night. I think I can, I think I can, I think I can! See, the jacket is all assembled and just waiting for some frosting and sprinkles! I totally love the lining, and have enough to make a matching blouse to go with. If I can get that done before next Saturday no doubt I can also walk on water! Alright, I am starting on the black trim. I will keep you posted on my progress, and wish me luck! Picasso had his blue period; I am in the midst of my black skirt period. You see, I started 3 black skirts when I was enrolled in the Open Sewing Lab class at Lake Washington Technical College last year. I was trying to use up a bit of my stash, and some black linen and black wool crepe started to morph into skirts. Yes, I buy a lot of black fabric. I like black. It looks good on me. It is my wardrobe basic neutral. I don’t wear brown; I only wear black. So there you have it – the story of how 3 black skirts in one season began. My 2 black wool crepe skirts originally appeared on this blog as part of the Sewing Marathon Weekend post, and both are made from Vogue 7937. Finally, one of them is wearable! I love, love, love the fishtail back on this skirt – it’s a little bit vintage and a lot of awesome-ness. I like the variety of views in this pattern, and didn’t find any glitches or special challenges with it. The hem turnback was a little shorter than I like, even tho I added an extra inch to the pattern, so I added some rayon seam binding to provide a nice finish and get a bit more length. I practised my catchstitch too! 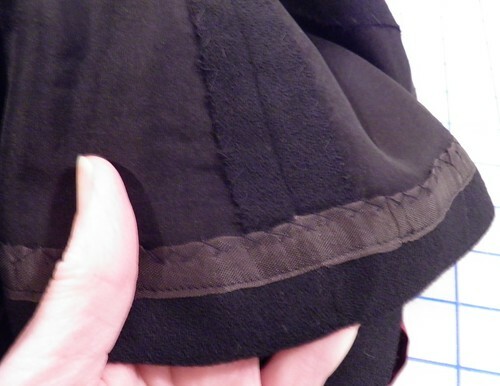 Since I had underlined the skirt with black silk organza, it provided the perfect layer to hold the hemming stitches as well as the basting stitches down all the the seam allowances. Very fancy pants, huh? I can’t wait to wear this skirt – I think it is a great design and I am overall happy with the construction. Happy sewing! This morning I barely finished my latte and scone before I was in the sewing room working on the polar fleece and leopard fur coat I promised my favorite six year-old. 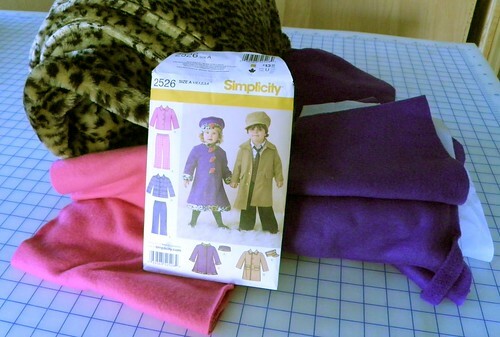 A few days ago I traced the pattern off and cut out the polar fleece pieces – but I hadn’t cut the leopard trim yet. Note the gi-normous roll of leopard fur above. Only about 25 times more than I need for my coat project! But since I got this large remnant from a dungeon sale on Ressy’s coop, the price was right and the rest will be put to some yet-to-be-determined use in the future. This pattern couldn’t be any simpler. 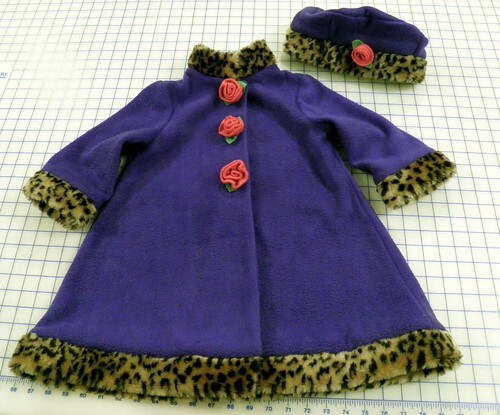 A back, two fronts, two sleeves, and 2 front facings out of the fleece, and then the collar, cuffs, and hem edging out of the leopard fur. Easy peasy. I had the coat totally done (minus the rose appliques) by 12:30! I was in the mood for instant gratification today, and I definitely got some! I didn’t get back to the hat until after dinner, but it was cut out and stitched up in a flash. The instructions called for iron-on interfacing and a lining. Bah humbug. 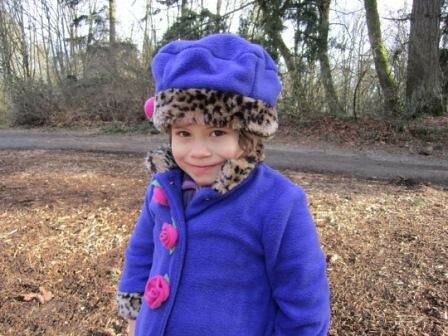 I made a couple of million fleece hats when my kids were young – and none of them were lined or interfaced. Besides, how many six year-olds do you know who can keep track of a hat for more than a few weeks? Right – none – so no way was I going the extra mile on hat construction. Seriously, can you stand the cuteness? 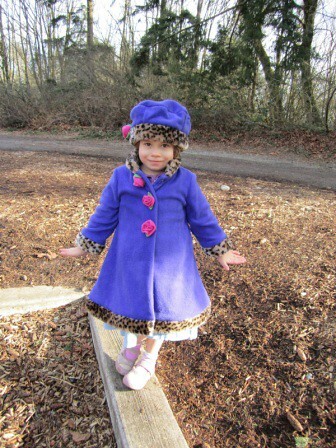 I wish I had a picture of my favorite six year-old in this adorable hat and coat….maybe next week! Every day is another chance to get it right. Yesterday is done, and all I have before me is today. Yesterday I didn’t work out. Today I did 40 minutes of cardio and some stretching. Yesterday I didn’t post to my blog on schedule. Today I am writing this “makeup” post. Yesterday I didn’t study my online marketing coursework. Maybe tonight after my last student lesson I will spend some time on this. Yesterday I didn’t get my “fishtail back” black wool crepe skirt hemmed and wearable. Maybe today I will. 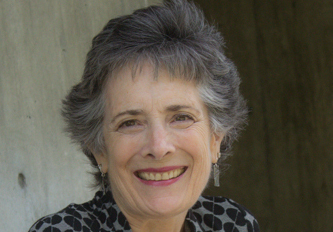 What is before you today, in the sewing room or elsewhere? I hope you got something sweet from your special valentine – I did! 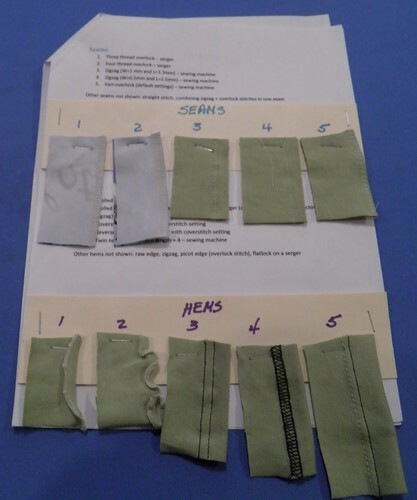 And predictably, I did not get much sewing done this weekend as I was prepping for my Take Your Tees to Terrific class at Pacific Fabrics yesterday. Please note my fancy-pants handouts above, complete with stitch samples! I wanted students to see how to take a garment that is not very interesting, or maybe has a stain or rip you need to hide or remove, and end up with something fun and funky. I must have been channeling Laverne in Happy Days with the swirly-girly bow I made from the neck ribbing, but I thought my upcycle turned out cute. Seriously cute, in fact! And since it was a $7 purchase from a consignment shopping trip with DD#2, I felt free to experiment and play. What do you think? Like it? I even salvaged the sleeves for some arm warmers, and the cuff for, well, a cuff! I think with a few buttons or beads added the cuff would be even cuter…I will get that done before shipping it off to DD #2. 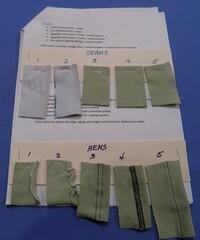 I think I just accomplished #8 on my 2011 Sewing Resolutions – “have fun with sewing”! Grrr. Life is getting in the way of completed sewing projects. I hate when that happens! My two black wool crepe skirts are still unfinished, no progress on my new knit dress, no progress of DD #1’s stack of alterations….the list could go on. And this weekend brings a quick trip north to visit DD #2 in Bellingham, 2 student lessons, and a group class at Pacific Fabrics. Yes indeedy, the odds are stacked against me right now. Dang it. Let me know what you are working on so I can live vicariously at least! Have a great weekend, and may you make more sewing progress than I! I learned something about myself recently, which is kinda cool given I am no longer in my teens or twenties. 😉 I learned I love teaching sewing. I always knew I loved to sew myself, but never thought I would be a) qualified, and b) capable of teaching this amazing, soul-satisfying craft to others. But I was wrong. 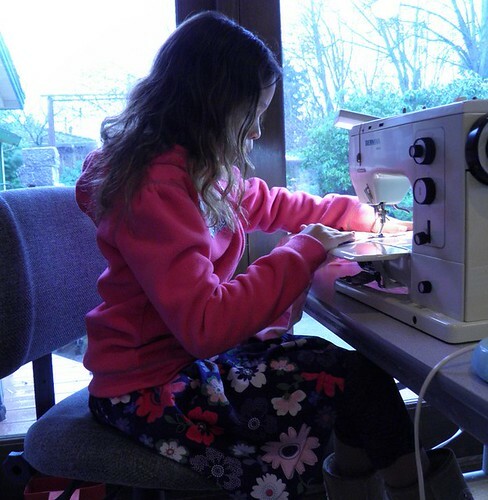 I get a runner’s high from teaching – it is seriously awesome to watch students of all ages light up when they complete their first sewing project, or master a difficult technique. I love to hear the pride in their voices when they talk about garments they have made. 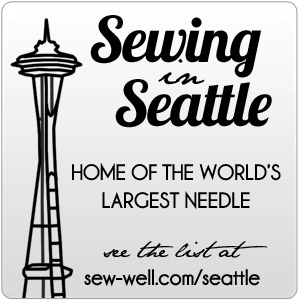 I have made loads of new friends, and met people with widely varying motivations regarding learning to sew. I have taught them a few skills, and in turn they have enriched my life. I am pretty sure I am the winner in this arrangement. 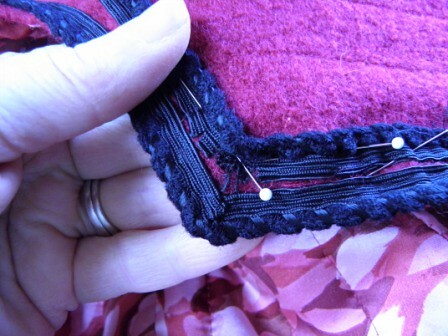 I received a wonderful gift when I was a young girl; my mother taught me to sew. Thanks Mom, I am passing it on now.